of Northern Switzerland and surrounding Central Europe. combining state-of-the-art tools MATLAB and Google Earth. Sciences, School of Engineering, Winterthur, Switzerland. The receiver that collects the raw data of the airplanes was developed by Marcel Rupf (ZSN) and his group. 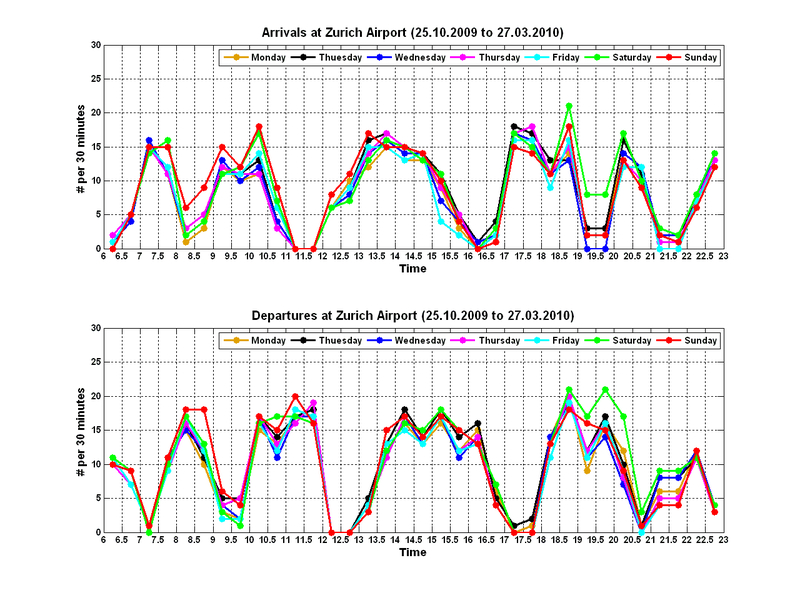 The well known application http://radar.zhaw.ch/, which was initiated and designed by Karl Rege (InIT) and developed as part of a diploma thesis at ZHAW, makes use of the same data. There is a huge variety of other data (static or dynamic), from various fields, which can be visualised with Google Earth. developed in this project is quite straightforward. Install Google Earth (GE), if you haven't done it already (to download: click here). To get an optimal view of the airplane trajectories, please change the GE settings as recommended below first. (a) If you use Mozilla Firefox, click here to download the application file. You will be asked to open the file "AirTraffic3D.kmz" with GE. Press 'Ok' and the application will start automatically. computer. To start the application, double-click "AirTraffic3D.kmz". Depending on the speed of your internet connection, it might take a few seconds to load the screen overlays and the airplane models after starting the application. As the initial altitude of GE is approximately 11'000 km above sea level, you need to zoom in to around 10 to 300 km, depending on the area and the level of detail you want to see. The trajectories and the information overlays on the left side of the screen are updated around every 10 seconds. While you are running this application, disable all layers, except: borders and labels, terrain, and 3D buildings. To prevent the airplane text become too dominant on the screen, set the label/icon size to small as follows: Select Tools in the GE menu, choose "Options" and set "Labels/Icon Size" to small within "3D View". Hide the sidebar to see the maximum area/airspace. To demonstrate some of the capabilities of the tool we provide several screen shots and movies below. Please note that the image resolution of the movies is reduced (in comparison to the original) due to file compression. By navigation in this context we mean that you (the observer) can move virtually through the 3-dimensional space. (2) by using the scroll wheel of the mouse together with some specific buttons on the keyboard. We recommend to use the second option, as it allows more precise and often faster navigation. Note that by additionally pressing the ALT button, the first three movements listed above become a lot smoother. Live air traffic over parts of Switzerland with Google Maps, developed at ZSN/InIT of ZHAW, best known as the "radar" project. The application is written completely in MATLAB (release 2009b) and runs on an ESXi 4.0 server with operating system Linux CentOS 5.4. The kml files generated are in accordance with KML version 2.2. The 3D airplane model was drawn with Google Sketchup 7 (Credits to Patrick13 for providing the basic version of the Airbus A340-300 model). Remo Maurer (Head IT, SoE) for providing invaluable support with the Linux server and for getting it running! Daniel Kramarz (InIT) for hints on connecting to the web service (raw data). Any comments and suggentions are highly welcome! Please find my contact information here. The development of the application presented here was not part of a funded project or any other ongoing research or teaching activity. The application presented on this website is for demonstration purposes only. All kinds of liability claims for the data presented here, their correctness, their accuracy, or any resulting conclusions on true airplane trajectories in the considered airspace are overruled. Nor myself neither my employer (ZHAW) shall be liable for any damage of any kind in connection with the use of this application. All information provided additionally by Google Earth is in the sole responsibility of Google, Inc.
Google�, Google Earth�, and Sketchup� are trademarks of Google, Inc.
MATLAB� is a registered trademark of The MathWorks, Inc.